“I leave you now with this one question, will you be my wife?” Elated, mesmerized and speechless, I jumped into his arms. Our lips met and tears flowed. “That is a yes, right?” he questioned me. In the midst of my excitement, I realized I hadn’t actually given him an answer. “Of course!” I shouted! The sunset that night over the water was unlike anything I’d ever seen. Dolphins jumped next to our boat as we headed for shore to celebrate with our eagerly awaiting families. It was the best night of my life! I was a college senior finishing my student teaching; engaged to my best friend and love of my life – we had been together for six years and the wedding was only three months away! Time couldn’t pass fast enough. Because he was in graduate school and I was finishing my teaching degree, we had been surviving a long distance relationship for the past year. Although it was challenging, the promise of forever was within reach. Things couldn’t have been more perfect. Each and every detail of the wedding was falling into place better than I could imagine. I was more in love with him than I'd ever been. Filled with joy and anticipation, I went to visit him. While there I accepted a teaching job and we found a house! It was our dream house - at the exact price we prayed for – with a rainbow over it when we drove up (no kidding)! Cards, flowers, romantic dinners, laughter with friends and worship at church… it was the perfect visit! The TSA agent urged me through security. Reluctantly I let go of the love of my life and proceeded through the checkpoint. Once through, I looked back one more time. His handsome figure stood in the corridor waving and blowing kisses. Tearfully, I blew a kiss back and thanked the Lord for blessing me with such an incredible man. Little did I know that would be the last time I would see him. One week later, I was in the height of student teaching and wedding planning. While working on the slideshow for the reception, my phone buzzed with a text message. I loved hearing that familiar ring tone! I lunged for my phone delighted to read what my romantic fiancé had to say. “We need to talk. I can’t honestly say I am in love with you – I haven’t been for quite some time. I can’t do this…” From my shaky hands, the phone fell to the floor. Surely not! This had to be a cruel joke. The lack of response to my texts or calls began to confirm this was no joke. This couldn’t be happening. The man who held me close and promised to never break my heart had left me broken, without a job, without a home, without a plan and without an explanation. He never came. He never called. I never knew why. The days and weeks that followed were torture. Never in my life had I felt more broken. I cried more tears than I knew any one person could. I felt as if I’d been run over by a freight train I never saw coming. He’d just given me his wedding vows the month before! There was no warning, no fight, no face-to-face conversation, just a text message after six years together… surely I would wake from this nightmare shortly. I struggled through school and work, desperate for any kind of closure or explanation. I was mentally, emotionally and spiritual devastated. 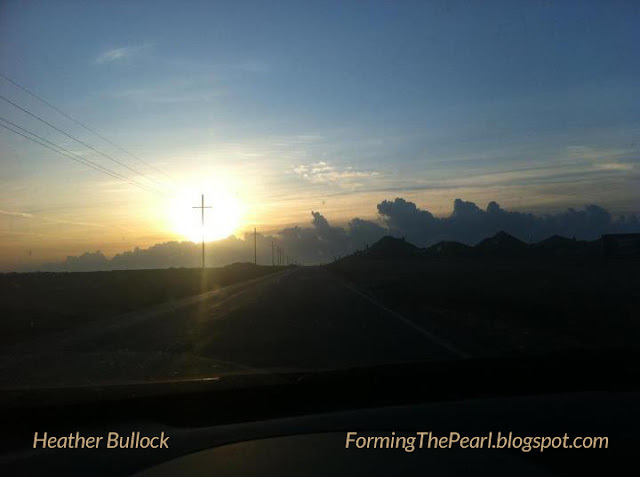 One month later, after another sleepless night, I was driving to school giving God an earful of my opinion. I cried, yelled, screamed, hit the steering wheel… I’m sure it was a site to my fellow early-morning drivers. For twenty minutes I carried on in desperation, knowing without a doubt that I heard God’s voice confirm the man, the future, the dream. “How could you let this happen to me? I don't understand! I KNOW WHAT YOU PROMISED, GOD!” I screamed. Angry tears stung my eyes making it difficult to see the road in front of me. Realizing I needed to look composed to walk into my classroom and greet my bright-eyed babes, I attempted to end my temper tantrum and gather myself. I turned east onto the road leading to the school. Storm clouds clearing from the nighttime shower, the sun began to rise over the lingering thunderheads. The sunrise was absolutely breathtaking. My spirit was quickly reminded of the faithfulness of our Savior. My attitude convicted, I took a deep breath. It is HE who allows the sun to rise each day. HE who allows me each and every breath of life. The ONE to whom the storm clouds answer. The beauty of the sunrise struck my spirit and an overwhelming peace enveloped my broken heart. Never do I have my phone out when I drive, but that morning I felt like I needed a visual reminder of God’s precious promise of peace. Driving 40mph down the road, I took my phone from my purse and quickly snapped a picture – I did not look, I did not aim, I did not stop. My mascara streaks erased, I arrived at the school and looked at the picture of the sunrise before I went inside. (See photo above.) I literally lost my breath and the tears flowed harder than before. I heard the Lord remind me, “Sweet daughter, I am with you ALWAYS; before every storm, in every storm and after every storm.” A telephone pole had been captured in the light of the rising sun creating an unmistakable cross as the storm clouds faded. It was in that moment I began to believe that I would survive this trial; that his rejection was simply God's redirection. Why is it that on good days, it seems so easy to walk in the faith and promises of the Lord, yet when a storm blows into our lives, we panic and seem to instantly forget who’s leading us? Whatever circumstance you’re in, God is there. He may not be easily visible, but He promises to never leave you or forsake you. In this life, we will all suffer pain, disappointment and loss, but God is in control despite what you or I might think or feel at any given moment. Sometimes He will calm the storm you’re in, other times He will calm you in order that you might withstand it, and other times, He teaches you to swim. Matthew 14 accounts Peter having faith enough to step out of the boat, yet he had to go “swimming” in order to learn the lesson necessary for his future ministry. Are you learning how to swim right now? Treading water is tiring, but it does build a great deal of strength and endurance! God is far more aware of your needs and desires than you are. If your storm is raging, recall who orders the wind and the waves. If you are navigating through the storm, be thankful that the Lord is your Captain. And if you’re swimming, keep treading water, trusting that He is your strength. God is in your storm as well as in the sun that rises after the clouds have dissipated. When you ask for His presence and His peace to permeate you (or you simply throw a giant-sized temper tantrum like I did) rest assured that Jesus will show up. Look to the heavens. See His beauty in the setting sun, relish His attention to detail in the night sky, and rejoice as a tiny seed pushes up through the dry earth and produces an oak tree. He is with you and will see you through any and every trial. Out of ashes, the Lord is capable of creating something more beautiful than imagined. Healing is a process, but six years later, I’m happily married to the rugged warrior God designed for me. (Knights in shining armor haven’t seen battle.) I’m eternally grateful God gave me a man who has a few dents, battle scars and victory stories. Together now, we look for God in the sunrise. Position your heart and position your faith. We are in a race! If you truly are a ready, willing, vessel, God will use to you to bring glory to His all-powerful name. Many lessons in faith, hope, and perseverance I continue to learn. Whether you are crawling, limping, walking or running this Christian race, be encouraged! Keep going! If you stay the course, you are guaranteed to be victorious! When I was born, neither of my hip sockets developed. Usually with braces, traction, body casts, etc., the sockets eventually form. As a result of the immediate treatments, my mother was never able to hold my bare body until I was almost six months old. Thankfully the left socket developed on its own – not normally, but it was functional. The right one hung limply by my side like a rag doll. “She will probably never walk, you know,” stated the doctor matter-of-factly. I have one of the most severe cases in the entire country… Thus began a series of treatments, doctor’s visits, 400 mile round-trip drives to seek help; thus began a nightmare. By God’s grace and help, my parents navigated graciously through my first three years. They got pregnant again. 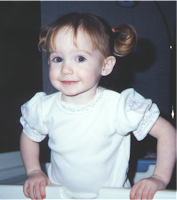 At the age of three, there was not much about the birthing process that I could comprehend. Mom said she was having a baby, and that I could have one too. I was thrilled! My baby was going to be “born” on the same day as my baby brother. It was going to be a girl, and her name was Oscar, yes Oscar! Amidst the excitement, my parents encountered another blow as the news that my precious baby brother was to be born breech; a sure sign that he would have hip dysplasia as well. They could do nothing but watch, wait and pray. October 12, 1992, my little brother was born. Unexplainably, he was born completely healthy and without any complications. Just after we brought brother home from the hospital, I went in to have a major surgery. This would prove to be only one of many. When I was younger, it was incredibly hard to understand why I had to be “different.” I wanted to run and play with my friends at recess, but I couldn’t keep up. I wanted to go sleep over at a friend’s house, but I was embarrassed because I would have to bring my leg braces. Around age three, I had a serious surgery that left me in a body cast. I a fiberglass cast held me hostage from my toes to the top of my ribs. I remember one of my aunts entering the hospital room. “Don’t look at me,” I told her. She said, “Oh, sweetheart, why not?” “Because I am ugly…” and the tears began to flow. I just could not understand why I had to be different from everyone else. I hated going out in public. A four year old should not be in a wheel chair! The stares and the glares were burned into my memory. My sweet little brother has always been there to take care of me. We attended the same school, and although he was three years younger, he was the first one to help me, to defend me, and to check on me. He never voiced it, but I know he has dealt with his share of jealousy and frustration. Instead of getting angry or envious, he became my friend. After every surgery he was the first one waiting for me. As soon as I was awake, he would be at the side of my bed ready to play dinosaurs or color with me. He has been one of the greatest blessings of my life and I don’t know what I would have done without him! The summer before my 5th grade year, my family and I were on a vacation to San Antonio, Texas. We had such a great time at the zoo, at sea world, and the Alamo. On the last evening of the trip, we ate in a small diner next to our hotel. Sleepy and full, we stood up from the dinner table. That is, everyone but me. I tried to stand and with an explosion, my right hip dislocated. I cried until I could not breathe. My Daddy carried me back to the hotel. When we got home to see a doctor, there was no doubt that my hip had snapped. Fifth grade was a difficult time. I had to walk with at least one crutch; I could bear no weight on my right leg without some kind of support. Nearing the end of the school year, we went to see my doctor in Albuquerque, New Mexico. Dr. Frederic Sherman agreed that something had to be done. 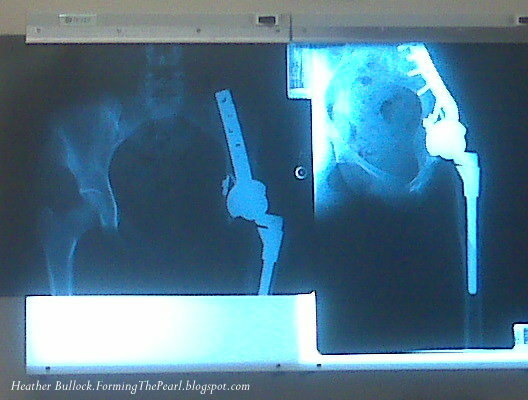 My right hip was completely dislocated, and as a result was almost 8cm shorter than my left. Surgery was indefinite that summer. In June of 2001, I was admitted to Carrie Tingley Hospital in Albuquerque. Originally I was going to have to wear a traction boot to help pull my leg (which was 8cm higher than it should have been) back into place. Upon arriving at the hospital, Dr. Sherman entered my room and announced that a simple boot would not be enough to do the job; my leg was far too misplaced. That evening I had a simple surgery to drill a rod through my right knee. The ends of the rod stuck out of my skin. Weights were rigged to the rod in my knee, and a week of hell began. Never have I been in such incredible pain. Sudden movements or jerks would send me into shock with pain. Of course, while in traction I would have a dream about being on a roller coaster. Vividly, I still remember what happened: the ups and down, the curves, twists and turns, and then the jerk. My body did exactly what my mind was telling it. It jerked violently as the “roller coaster” rounded a corner. I woke up screaming in pain, my mother who was sleeping in the chair next to my bed woke equally startled. Nurses came running into the room and have to give me a shot to sedate me and get the pain under control. However, the worst of the pain was not over. It was the morning of the surgery, and I had to be unhooked from traction. Knowing the pain would be unbearable, I had already been given sedatives and pain medicine. The doctors come in to my hospital room and began to remove the weights attached to my knee. The traction had worked and my legs were now of equal length again. Yet, when they removed the final weight, my hip dislocated once again. Like the snap of a rubber band, I felt my hip jump up to my ears! Screaming with pain, the room went black and I was unconscious. The fusion was successful although it did take away all motion in my right hip joint. I had to swing my leg to walk and was not able to put my shoes and socks on by myself. It was an adjustment but I did feel better than I had in quite some time. Two years later, knowing no boundaries, I decided to try out for the cheerleading squad. Against all odds – mind you, I can’t jump or tumble due to my hip – I made it. The next four years I spent burning with passion on the sidelines. For the first time in my life, I felt normal. I felt as if I fit in. My junior year of high school I began struggling with chronic, intense hip pain again. Concerned, my parents and I packed up for another trip to Albuquerque. My appointment was the day before my football team was to play for the state championship. A welcomed distraction, my mind was on the team and getting to the game! However, upon holding up my x-ray, the doctor jolted me back into reality. “How in the world…” The confusion and fear on his face alerted me that something was seriously wrong. He then pointed out to my family and I the giant crack in the metal rod in my leg. Yes, this is a tough, thick piece of metal that due to my “active lifestyle” I had managed to not just crack, but break in half. My heart broke as the doctor looked at me and said, “Maybe you need to give up cheer.” Pleadingly, my sweet Mother looked at me with tears in her eyes begging the same thing. My head is as hard as a rock and I was just determined to ignore it, work through the pain, and get to the state game. Upon arrival at the football field, my squad embraced me inquiring of my appointment. “It was fine…” We had a job to do and at this moment – I was still cheering. The boys won and we screamed in victory and posed for pictures. As we climbed back on this bus, I had the sinking feeling that this could have been my last game to cheer… ever. Through some prayer, my Mother’s desperate plea to have me stop before I do more damage, and basically my stubbornness, I was decided to finish out the season. After all, state cheer competition was only five months away! The pain was intense and I consumed prescription pain pills as if they were M&M’s. 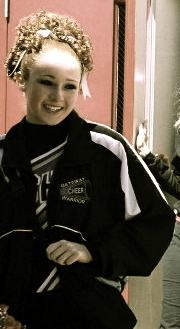 We went to state cheer and won 2nd place, losing by only one point! I did not cheer my senior year… it was difficult to let go of my passion but I worked as a youth league coach to compensate for my sweet sorrows. After graduation, I moved to Texas to attend college. The rod in my hip totally severed, I walked around with bone grinding on bone. The pain was now excruciating and began to interfere with my social life. As a college freshman I declined invitations to play sand volleyball and ultimate Frisbee simply because I was in so much pain – let me remind you, I am a stubborn person. For me to admit that I “can’t” do something is HUGE. Unfortunately, we were at the end of the road and without many options. I had already had eleven surgeries and those held a minimal success rate. The only option left was a total hip replacement… at the ripe age of twenty, the last thing I wanted was a hip replacement. Wanting desperately to enjoy my college experience, I put off making the dreaded decision. The doctor and my parents were patient and complied with my wishes, however in December of my freshman year of college, the broken portion of the rod had to be removed from my femur. The surgery was minor – the goal being to allow my femur to build back bone before a total hip replacement was possible. I returned to school in January on crutches and finished the semester. The pain continued to increase and also continued to negatively impact my friendships, relationships and mental health. Living with intense, chronic pain is not something I wish on anyone. The summer between my sophomore and junior year of college, I made the decision to have the hip replacement. Reason and logic told me to wait until I graduated, but desperation, pain and love made the decision easy. One of the most difficult surgeries I have had, I came through with a long road to recovery. Because my hip had been fused for almost ten years prior, all of the muscles, tendons and ligaments surrounding my hip joint were beyond atrophied… some the doctor even considered, “dead.” It was going to take over a year for my body to recover and build muscle that never existed prior. My surgery was June 25, 2010… in August, I returned to school to take 16 hours worth of classes and serve as the Director of Freshman Orientation for the university (this was a bad idea). Thanks to God’s grace and the help of many friends, I went to physical therapy three time a week and managed my class load. My hip just celebrated its two year anniversary. Yes, I celebrate June 25th every year. In addition to it being my best friend’s birthday, it was the day God gave me my life back. It was the day that He used a doctor to heal my body. This healing has been long awaited… many tears and many arguments with God. I desperately believed in and desired a miraculous healing, however through my pain, so many more people were able to witness Christ’s faithfulness in my life. It is my testimony. No longer do I run from my pain, but rather embrace it as Paul did his “thorn in the flesh.” If this is the very tool God chooses to use for His glory in my life, who am I to stand in the way and argue? I was in physical therapy and worked with a trainer for over a year and a half. God has been faithful and has used my story to help other people. I have a very special place in my heart for the Ronald McDonald House… ask God for divine appointments and He is more than happy to oblige! Today I am healthy and well – there still is pain and stiffness and some limitations, but trivial compared to my younger years. I help coach a cheerleading squad, scuba dive, compete in pageants and even skydive! Sometimes our faith walk is much like my journey. Keep walking on ahead in the Lord. If you are not constantly making forward progress with our Maker, you are stagnant… Revelation 3 warns about becoming stagnant – don’t allow excuses to keep you there! You may limp, you may stumble, you may even need intensive surgery followed by rehab, just know that our Lord is faith and patient in each stage you go through – just KEEP GOING!